This is the second project from Swiss design group Micasa Lab that I’m in love with. 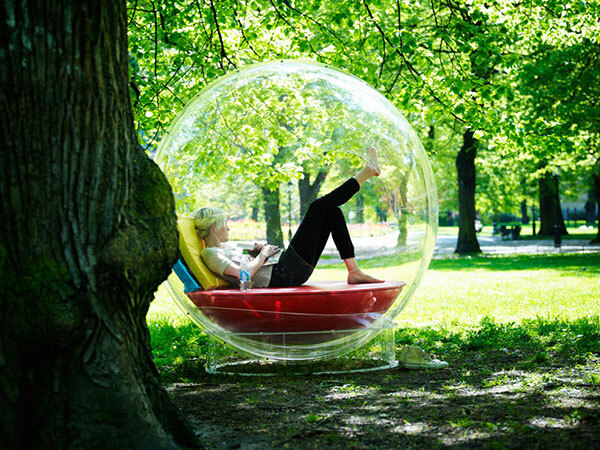 The Cocoon 1 is a sit in, chill in, relax in, live in bubble with reconfigurable cushions to really personalize the space. I think it’s a genius idea. A retreat that simultaneously informs the world of your need for solitude while giving you full access to the world around you. Plus, this revives memories of that terrible excellent movie Bubble Boy about a man born without an immune system so he has to live inside a bubble. Good stuff. Micasa Lab, together with The Nordic Invention have designed an incredible piece of furniture. It’s called Cocoon, and it’s a self-contained living space – not only for indoor, but also for outdoor use. Cocoon is modular. You can put configurable cushions in and out, and design its interior to your own needs. The bubble has only one small hole that connects it with the outer space. No matter where you put the Cocoon, it’ll be a perfect reading retreat.